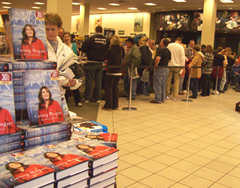 Hundreds file through Sioux City’s Barnes & Noble to get Sarah Palin’s autograph. A few camped in the parking lot overnight for the chance to be at the front of the line when the former Alaska governor entered at about 1:30 p.m. Sunday, about an hour and a half later than scheduled. Jennie Klatt of Spencer was among those who braved single-digit temperatures and the fierce winds that campers say tore through the parking lot, starting at about 3 a.m.
“Sarah Palin is so courageous. She’s put her political career on the line so many times to take a principled stand,” said Klatt, who wants Palin to run for president in 2012. Michael Thompson of Council Bluffs, Iowa – a member of the 9/12 group who attended the State Tea Party Convention in Des Moines last month, would like to see Palin start campaigning in Iowa. He stood in line today to get an autograph – and to hand Palin a couple of letters. “With suggestions, that we hopefully can get in her hands…It would be nice to have, say, a small arena or stadium where she could answer questions and people could spend a little bit more time (with Palin) than 30 seconds getting a book signed,” Thompson said. Iowa’s Caucuses are the lead-off event in the presidential nominating season and many prospective candidates author books as a way of introducing or re-introducing themselves to voters. In 1998, for example, Lamar Alexander’s “Little Plaid Book” was a play on his penchant for campaigning in red-plaid shirts, but the book failed to translate into a Caucus victory for Alexander, who dropped out of the 2000 presidential race before the Caucuses were held. Mike Huckabee, the winner of the Iowa Republican Party’s 2008 Caucuses, made stops at Iowa bookstores in November of 2008 and again last month to sign copies of his last two books, but today marks the first time Palin has visited Iowa since the 2008 campaign. Republicans in the area had hoped Palin would appear at another event, besides the book signing. The crowd of onlookers – once they got their brief look at Palin – rushed into the warmth of the mall, many stopping just inside the mall’s doors to see if they were able to snap a frame with Palin in it. Todd Sargeant, a 22-year-old Lebanon, Ohio man who arrived here in Sioux City 24 hours ago so he could be at the front of the line to get his two books signed, walked out of the Barnes & Noble smiling. “She said, ‘I hope you didn’t have to wait long,’” Sargeant recounted, with a laugh. By 2:30 p.m. the long line of autograph seekers waiting in the mall had evaporated, as Barnes & Noble staff herded people inside the store to wait for Palin’s autograph. Just before three o’clock, the doors to the store were closed and shortly after 3 p.m. Palin finished her autograph session. She spent a bit more time in the closed store, posing for pictures with local law officers who had provided security for the event and chatting with bookstore staff. Her next book tour stop is in nearby Sioux Falls, South Dakota, where she is scheduled to start signing copies of her memoir at 5 p.m. tonight.